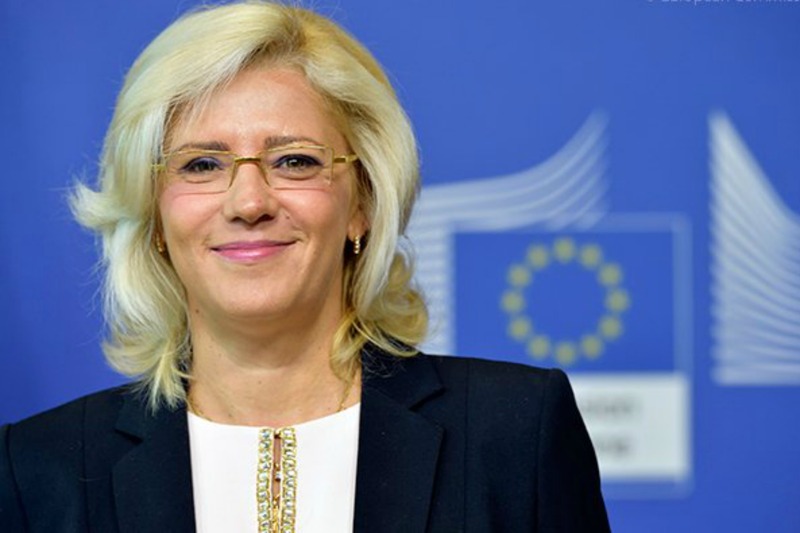 “My intention as a social democrat is to cut financing of projects that involve luxury investments which are not absolutely necessary, like fitness and SPA centres,” Corina Cre?u, the new Romanian commissioner for Regional Policy, told EURACTIV Romania in an exclusive interview. Corina Cre?u, a former journalist and former spokesperson of President Ion Iliescu, has been an MEP for almost eight years, and held the post of Vice-President of the European Parliament before she was approved as Commissioner. She spoke to EURACTIV Romania’s Ioana Morovan. What’s your opinion on Parliament’s confirmation the Juncker Commission? Do you think the position of the Eurosceptics will affect your future collaboration with the MEPs? It was a very good result. The 423 votes “in favour” are very important, especially when considering the actual structure of the European Parliament (EP), with over 150 Eurosceptic MEPs that belong to political parties which positioned themselves, in general, against the European Union. What really surprised me was the vote of the Greens. They have a strange position in relation to our Hungarian colleague [Tibor Navracsics] and also in relation with their objectives. Moreover, the liberals expressed harsh criticism the night before the vote, but eventually voted in favour. Still, I don’t think it will eventually affect the collaboration with the Parliament, at least from my perspective. As I already said during the hearing, I will work with all political parties and I really intend, in all the regions where I will go, to inform and invite the MEPs representing those regions to join the delegation and to participate. This communication with the European Parliament is extremely important, and it reflects a mutual benefit. In the Regional Development Committee, at least, there are many new members who worked in the public sector and know the situation “on the field”, so the collaboration with all the political groups is very important. To conclude, it is an important result and for the first time in the last 15 years, the Commission will start its mandate on time. Everybody is really looking forward, because there are many issues on standby, many files that are waiting to be solved. We will have a lot of work from the very first week. What are, concretely, the activities you will undertake in the first weeks? At present, we are in the phase of signing the Partnership Agreements with the member states for the 2014-2020 European funds. The Commissioner Hahn [the outgoing Regional Policy commissioner Johannes Hahn, who now takes the portfolio of Neighbourhood Policy] wished to sign all of them until the end of October, but I’m not sure it will be possible. Anyway, we will start negotiations for the Operational Programmes. [It’s] a very important process, because every country will have to respond, through the Programmes, to the new legislative framework. From my point of view, I must declare that the number one request will be that of creating jobs, to respond to the people’s necessities. Thus, we will analyse each program and we will follow this criteria. There will be over 300 programmes in this period and I intend to finalise about 150 until the end of the year. This also depends on the members states, namely if they come with good quality programs. What do you intend to do in order to save the absorption of EU funds available for the 2007-2013 framework, considering that 2015 will be the last year when these funds can be spent? There are 5 member states, including Romania, which spent less than 50% of the available EU funds. I intend to organise a working group to help these countries. I know that every country has ambitious projects. For example, Mr. Teodorovici [the Minister of European Funds in Romania Eugen Teodorovici] is talking about an absorption rate of 80%. It is true, much progress has been made since 2011 to reach the 40% level of this year, but I am not sure if these countries will achieve in one year all they could not do in the last seven years. In any case, from my perspective, we, the European Commission and the DG Regio units, are trying to launch some aid instruments for technical assistance, including to send specialists to these countries, because there are important funds at stake, which otherwise may be lost. It is important to spend these funds in the countries which are less developed. I myself come from a country where seven regions out of eight are among the least developed in Europe, so I consider it a moral obligation to focus on those countries that have the greatest need for European funds. But, at the same time, I won’t accept less quality in spending these funds. I will never accept fast spending of funds over a good quality spending. It is important to use these funds to create added value and jobs. I think that we also need to launch a more active communication program. I am sure that not all beneficiaries, or potential beneficiaries, know very well the rules which now are more clear and the procedures which have been simplified. One of my priorities is to improve, at the level of the European Commission, as well as at the level of the member states, the communication regarding the role and benefits that the Regional Policy brings to the life of each EU citizen. We must encourage the member states to use all the instruments available: technical assistance, professional trainings, financial instruments provided by the European Investment Bank. One of the priorities will be encouraging SMEs: many of them are avoiding to access European funds. But there are many instruments like Jaspers or Jasmine, already used in other countries, which can help significantly. We will work with the European Investment Bank on financial instruments and I would like to develop the communication program. Which are, at the starting point of the new financial framework 2014-2020, your main recommendations for the member states? On one hand, the new rules bring the pressure to simplify the procedures, on the other, control is very important. What we need to improve most is the administrative capacity. For the 2007-2013 period, from all the cases, 7% were found with irregularities, out of which only 1% were frauds. The others were errors – results of a weak administrative capacity. So the member states must be aware that this is a weakness. I want to stress that the role of the European Commission, and mine as well, is not that of punishing, but rather that of facilitating, namely of providing the necessary technical assistance. That being said, the member states are responsible for applying the strategies at national level. In what concerns the consultation of the private sector, of social partners and of local authorities, there were complaints in Romania regarding the way it was organised so far. What can be done to improve the consultation framework? For the 2014-2020 period, it is absolutely necessary to consult all the partners from the local level, at all the stages, starting with the elaboration of programmes and ending with their implementation and evaluation. I want to stress that it is very important to give a larger role to local and regional authorities. They must be involved, in my opinion, at all the stages of the decision process. They should know better what are the needs of the people, and also the solutions. We must learn, because there are countries which do not have this culture of dialogue. Some countries have much more experience in involving civil society, NGOs, the academy. It is possible that we (will) launch some instruments for exchange of good practice. In this respect, I intend to visit as many regions as possible, out of all the 270 regions of the EU. The first visit will be in Poland, which is the biggest recipient of European funds, and after that, possibly Romania. I will also go to France, which will launch the Operational Programs for public consultation in November. You said that the quality of spending is more important than speed. What does this mean, concretely? As you know, there are 11 thematic objectives set by the European Commission which must be taken into account by the Member States when they draw their investment priorities. Within the framework of the submitted Operational Programmes, we will evaluate these objectives and how, in their context, growth will be encouraged and jobs will be created. We must give the necessary attention to each field and especially to those that create jobs. There are also the ex-ante conditions, at national level, so there are several quality criteria. My intention, as a social-democrat, is to cut those projects that involve luxury investments which are not absolutely necessary, for example fitness and SPA centres. But still, we will analyse each case individually. For example, in Poland, in a deserted village, an old castle was renovated, and an SPA centre was built with European funds. It is true, this investment reinvigorated the village. But, as a general rule, we must cut the luxury investments. I do not want to criticise, but we cannot afford them in these times. Moreover, the legislation does not allow member states to waste money. We take as a reference the biggest necessities, and the fact that there are millions of unemployed people. We must think about research, innovation, supporting SMEs. How will you collaborate with your colleagues from the European Commission, within the new structure, proposed by President Jean-Claude Juncker? This is the first time that the structure of the Commission involves Vice-Presidents. There are 7 work matrices, and I am part of five of them. I will have to collaborate with the Vice-Presidents in charge with Economic Growth and the Energy Union, but also with many Commissioners. In addition, I have already started to work with the services of DG Regio in order to support the ambitious project of Mr. Juncker of bringing 300 billion euros in three months – in relation to which, we, within the framework of the regional policy, will have an important contribution. Basically, it will be done with the support of the financial instruments and of the innovation policy. As a general idea, Mr. Juncker has brought many innovations that will prove their efficiency in time. Nonetheless, the Commission is a political coalition, perhaps in the most political formula since its beginning – in essence a request of the European Parliament and of Mr. Juncker. I hope it will function. EURACTIV Germany: EU-Regionalkommissarin Cre?u: "Luxus-Projekte werden nicht mehr gefördert"
Ok Mrs Cretu – as you know there are 10 of millions of homes that are badly insulated in Europe. Getting them up to a good insulation/energy efficiency standard is labour intensive – and given the number of dwellings this would provide jobs for millions of people for decades to come. I’d suggest this was a good place to start given that most of the companies doing the energy rennovation would be … SMEs. Mike I actually earn just the limit ! Now If you’re asking me to change the wood windows for better isolation ..how should I pay a good efficiency window by min 500€/each without labour costs? If a lot of citizens cannot afford “energy efficiency” then the unemployment will remain @ the same Level ! The core of the unemployment is surely not due by Mike I actually earn just the limit ! The core of the unemployment is surely not luxury investments in a company’s fitness-center but merely but the lack of consumer protection laws for the economy and the missing common rules for a single economy ! The problem is connecting up-front capital costs (financing insulation or double glazing) with long term energy savings. That is what the EU generally and governments in particular should be focusing on. Low cost financing (2 or 3% interest rates) would solve this problem. In turn this would solve the employment problem because SMEs would develop to service this market.